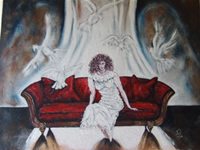 I started painting about 9 years ago and have sold many works, mainly commissioned. 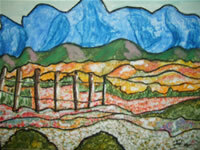 My work is well known on the West Coast and I am a member of the West Coast Art Guild and also Velddrif art. I have started a little business - FATE - Facilitators for Art and Traveling Exhibitions, which is doing well. My aim is to include the works of more artists than the 35 currently registered with FATE. It is difficult for us to market our work elsewhere because we are so far away from everything therefore FATE travels with art. I am mailing some of my own work for your information, if you are interested in contacting FATE kindly use the cellular number supplied. Thank you, regards Juli Olivier.